GitHub - afhaque/MeanMapAppV2.0: App demonstrating MEAN (Mongo, Express, Angular, and Node) Integration with Google Maps. Created for Scotch IO Tutorial. 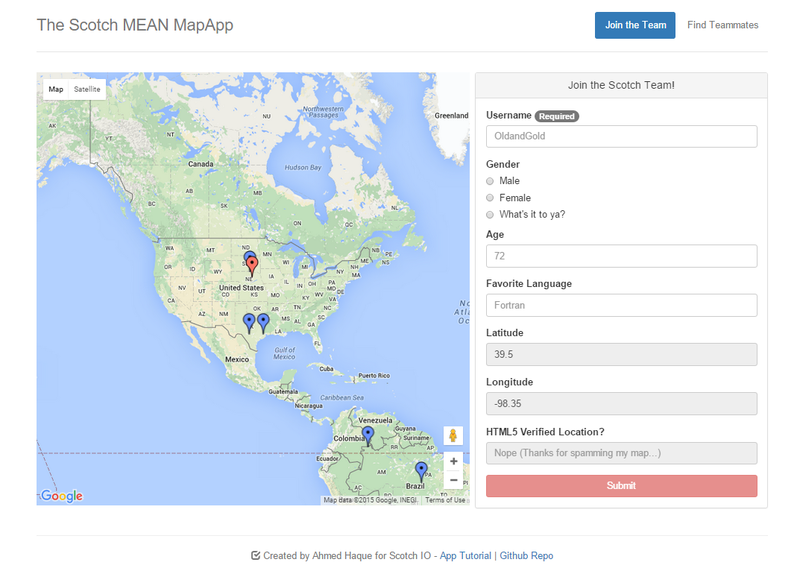 App demonstrating MEAN (Mongo, Express, Angular, and Node) Integration with Google Maps. Created for Scotch IO Tutorial. Want to be notified of new releases in afhaque/MeanMapAppV2.0? Basic application demonstrating MEAN (Mongo, Express, Angular, and Node) Integration with Google Maps. Application allows users to add themselves onto a Google Map map with identifying markers based on their form response. The application also demonstrates the use of HTML5 validated geolocation and the use of geospatial filtering through MongoDB.